Get to know the amazing creatures right outside your door! What do toads like to eat? Why do crickets sing? Why does a firefly glow? If you've ever longed to know more about the habits of the animals and insects that live in your backyard, here's the book you've been waiting for! With Backyard Pets, you'll find out how to catch and care for lots of different, easy-to-find critters, from terrific toads to slithering slugs. You'll perform all sorts of investigations and activities, including discovering how snails eat and how caterpillars protect themselves, before you return your newly found pets safely to their natural home. And you'll even find out how to attract birds and butterflies to homemade feeders and gardens so that you can observe them every day as they go about their amazing lives. As you take care of your pets, you'll learn how to interpret fireflies' signals; how to entice worms from their burrows with sound; and how to make birdfeeders, hummingbird gardens, and toad abodes. Along the way, you'll discover lots of fascinating facts about the lives of these clever critters - from what their favorite foods are to how they see, hear, and move, and even how they help the environment. As you take care of your pets, you'll learn how to interpret fireflies' signals; how to entice worms from their burrows with sound; and how to make birdfeeders, hummingbird gardens, and toad abodes. Along the way, you'll discover lots of fascinating facts about the lives of these clever critters-from what their favorite foods are to how they see, hear, and move, and even how they help the environment. CAROL A. AMATO is a nature science educator, language-learning specialist, and nature writer. 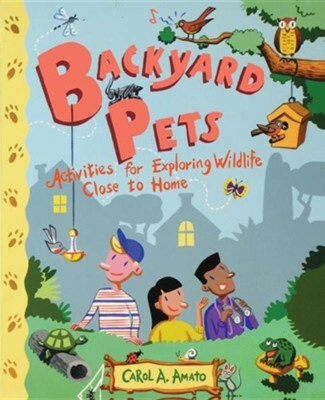 Backyard Pets: Activities for Exploring Wildlife Close to Home by Carol Amato, illus. by Cheryl Kirk Noll, starts off with "Bringing Backyard Pets Home," focusing on critters like snails, worms and caterpillars, and offering basic information as well as investigations and activities for first-hand learning. Birds and butterflies share the spotlight in Part II, "Attracting Wildlife to Your Backyard." A glossary, index and suggested reading list are included. (Apr.) Copyright 2002 Cahners Business Information. I'm the author/artist and I want to review Backyard Pets: Activities for Exploring Wildlife Close to Home.